The police said that the boy was promised a sum of Rs 2 crore on successful completion of the game. He was saved in the nick of time by his friends and a teacher. Indore: A class 7 boy was saved in the nick of time on Thursday afternoon as he tried to jump off the third floor of his school building, allegedly in order to complete the final stage of the dreaded Blue Whale Game that hooks teenagers and then coaxes them to commit suicide. According to the police, the boy, a student of Chameli Devi Public School in Indore, was trying to jump off the building to complete level 50, the last stage of the game. He was stopped by his friends and a teacher, who had spotted the boy roaming perilously close to the edge. The police said that the boy was promised a sum of Rs 2 crore on successful completion of the game. 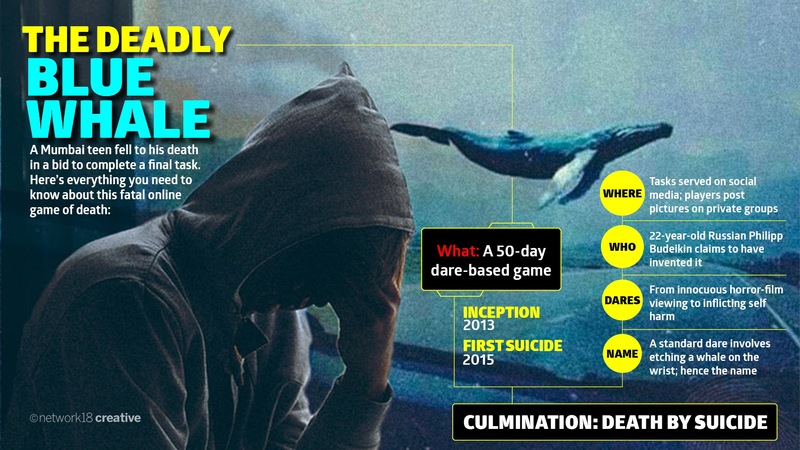 The deadly game that overpowers kids and asks them to commit suicide has become a talking point in the nation after a 14-year-old boy in Mumbai ended his life recently by jumping off the terrace of a seven-storey building. Police investigations showed that the boy was addicted to the game and had been searching online on how to jump off the building two days prior to the suicide. Reports of the growing popularity of the challenge has led to police and administration in several states issuing advisories to students, teachers and parents. The issue has also been taken up in the Parliament, with legislators asking the government what steps have been taken to curb the challenge. In this shadowy underground challenge-based game, teens are given tasks to complete that include things ranging from something mundane to inflicting self-harm. There are 50 levels, with the extreme nature of the tasks growing by each level. Game ‘administrators’ elicit the personal information of the kids to ensure they do not back out. The tasks in the game include climbing a crane, carving a specific phrase on the person’s own hand or arm, doing secret tasks, poking a needle to the arm or leg, standing on a bridge and roof, listening to music, and watching videos sent to the challengers by the administrator. The final level is committing suicide. Players are required to upload photos of the completed tasks, and if they refuse, game administrators may threaten to harm family members or come and do the task for them. Therefore, once who begin the game, it becomes near-to-impossible to back out. The game is said to have originated in Russia. It was created by 22-year-old Philipp Budeikin, who is currently spending three years in a Siberian jail. The game has reportedly claimed the lives of more than 130 kids around the world.